Bat Rabies – How Common Is Rabies From Bats? When people think about bats in their house, the word rabies often comes to mind. In the U.S. death from rabies is an extremely rare thing to happen when you view the raw statistics. There are about 1-2 people who will die from rabies contracted by a bat every year, according to the CDC. A given percentage of bats will be positive for rabies, but it’s a very small percentage considering the overall bat population, about 0.03% to be fairly accurate. With that in mind, the possibility still exists and should not just be ignored. Why risk it? It has been documented that bats have spread rabies to cats and dogs before. We’ve all seen the movie Cujo about the dog that goes wild and starts killing people when he contracts rabies from getting bitten by a bat near the beginning of the movie. While Cujo was a fictional story, it can happen in real life too. The part about a dog getting rabies from a bat anyways… Dogs getting rabies from bats is dramatically more likely than it happening to a person. That’s simply because dogs have no fear of attacking a bat flying around. It just looks like a flying toy to them! It is very important to have your dogs vaccinated for rabies every 4-7 years. While some state laws require some cats and dogs get vaccinated every year, it’s entirely unnecessary. If your cat or dog has been vaccinated for rabies already, then you’re all good! It is not possible for your pet to get rabies when it has already received a vaccination. As frightening as a bat flying around in your house can be, there are still situations where people attempt to handle bats on their own. Especially in circumstances where the bat has invaded the confinements of the person’s home. Bat Removal Pro experts do not recommend untrained personnel to handle bats flying in their house. Bats WILL bite you if you try to grab them or otherwise handle them in any way, just like any wild animal would. It’s best to leave that job to a professional. Most all of Bat Removal Pro’s certified companies can offer emergency bat removal service, even if it’s late at night. Visit our directory to find a professional who can help you get the bats out of your home. Most states have laboratory’s that will test animals for rabies. In your particular State, an internet search such as “Rabies Testing Lab In (your City or State)” should provide some results as to what agency can help you, and how to contact them. Generally, there should be rabies testing labs at your local Department Of Agriculture or Health Department. 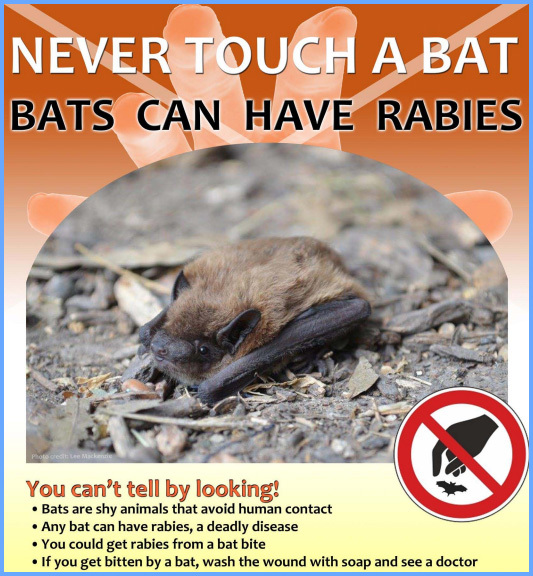 If you’re going to test a bat for rabies, the bat, unfortunately, must be euthanized. We do not like to see this happen, but when a person’s life is at risk, it becomes necessary. Bats become untestable after about 3 days when it has not been stored properly. If you’ve caught a bat and it has been euthanized, store the bat in your fridge or freezer, just make sure to thaw out the body before you turn the bat into the department where it will be tested.